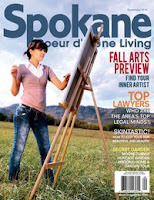 A developing story on a Spokane landmark. Show Me the Money! But just a little bit. 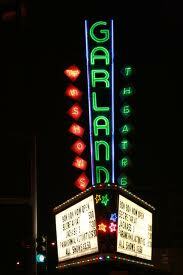 When the Garland Theatre opened in 1945, it was the the place to be seen and the place to see films. The theater was very forward for the time, with wide aisles and a cup holder in each reclining seat. A novel idea was the snack bar. Today the Garland is an icon with all that old style. Its well perserved, staying true to the era. You not only get to see the show, you also get to experience movie theater history with a retro cool style.The Garland is Spokane's only Independent Encore theater. Okay, you aren't going to see new releases or sneak previews. But if you can handle not seeing it opening weekend for at least twice as much, the Garland might be a place for you. You do get fairly current films and occasionally a cult classic or two. Cheap Thrills await you at the Garland Theatre. BON BON, a concession stand for adults. Today there's a VINTAGE COCKTAIL BAR at the Garland Theatre is called BON BON, and it's tagline boasts "tasty drinks and delicious treats." This mini-bar is nestled in the west side of the historic theater with the distinct repurposed signature-style of developer/artist Dan Spalding. Think of BON BON as a concession stand for adults with a well appointed bar menu of classic cocktails with a contemporary twist. Fun film reel cocktail tables and a movie set-styled light fixture make this another creative addition in the Garland neighborhood. You can stop by for a drink or a bite thanks to an outsourcing deal with the local restaurants. Crystal Bertholic, whose business card reads Keeper of the Bar, says BON BON will keep the spotlight on cocktails but the bar continues to evolve. Craft cocktails, a wine list of affordable hidden gems and an awesome rotating selection of micros on tap. The hours are flexible as well; if customers are there, BON BON will stay open until 1a.m. The bar has a few beers on tap assortment red and white wine that will be switched out periodically. Keeping the former soda fountain feel, there are glass jars filled with old-time candy cigarettes, gumballs and Pez. 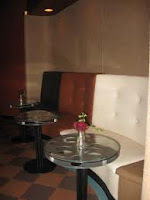 The retro cool bar has been welcomed nicely to the neighborhood. So here's the BIG news. A recently passed bill in Olympia could allow you to drink (Beer & WINE) in the Garland theatre. Can't you imagine sipping vino while viewing? The way it would work is that the theater would apply for a Restaurant license, which would require them to expand their menu. If they applied for a Tavern license it would mean a 21+ only audience which would limit their audience and change it from such a family friendly destination. Sounds great, but a more pressing concern for the theater is updating its equipment and the change-of-use would require costly improvements from our fair city before they could even consider pouring. The Garland Theatre is a Spokane treasure. Our city should to everything possible to assist this historic landmark to be able to take advantage of this opportunity to expand their audience and continue to be a iconic Spokane landmark. Newly elected Mayor Condon, should debut by including helping this Spokane landmark stay relevant for generations to come. Cheers! to not having to sneak wine in the theatre.